Saarpark-Center Neunkirchen is easy to reach by car and public transportation. Find out everything about how to get to our shopping center here! 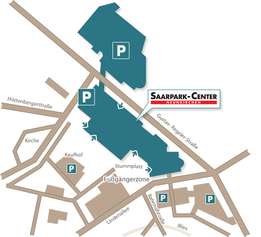 Saarpark-Center is easy to reach by car or public transportation. It lies right in the center of the city and can therefore be easily reached on foot via the many paths through the city center as well by car using the well-developed and dense road network. If you are coming from outside the city, you can easily reach Neunkirchen via five highway exits, which are no further than two to five kilometers from the city (exit Neunkirchen City).